Dirt, grime, and mold can build up on the sides of your home and fencing. A soft pressure wash from 214 Pressure Washing will clean your exterior walls without harming the stucco, stone, brick, vinyl or other building materials. The solution based soft wash will not harm painted exteriors. The Dallas Ft.-Worth Metroplex area can experience harsh winter weather, windstorms and heavy rains along with intense summer heat. The wind, rain, dust and even freezing weather can lead to the build-up of dirt on many exterior surfaces. A professional washing will improve your curb appeal and restore the natural colors of your home’s exterior without harming the surface. A special cleaning solution is applied using a high-volume pressure system. This hose system sets the pressure level necessary to remove dirt and grime based on the surface materials. Cast stone, natural stone, brick and similar materials will eventually disintegrate when exposed to high-pressure washing. Grains of sand and other materials can be washed away with continued water pressure on a high setting. Paint can be removed with too much pressure. Special equipment operated by trained technicians must be used to treat stone and brick on homes and fences. The soft wash solution will remove dirt, rust and even tannin stains caused by trees with the right chemical mixture. The original texture of the walls will appear brighter. The soft wash will also clean grouting or mortar without damage to its surface. 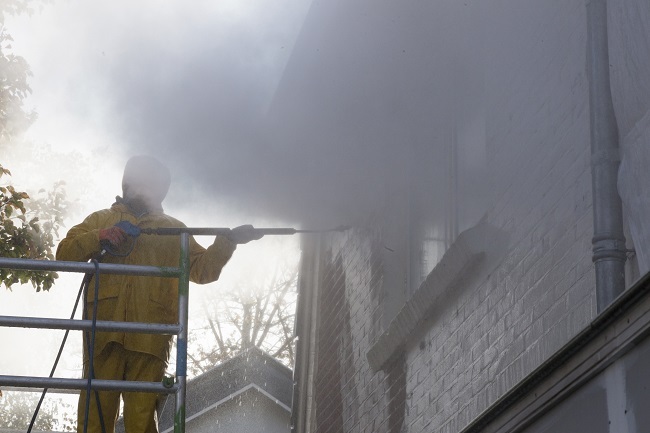 Professional technicians at 214 Pressure Washing have the equipment necessary to reach upper floors and the area under the eaves and gables of a roof where mold can grow. They carefully clean the walls around rain gutters that can collect excess debris. Contact us for information on washing your pool deck and walkways in addition to a soft wash for your home.